Observed on a partially shaded slope adjacent to Peppersauce Canyon, Sta. Catalina Mts., Arizona, USA. 18 April 2010. The excerted stamens are easily seen. 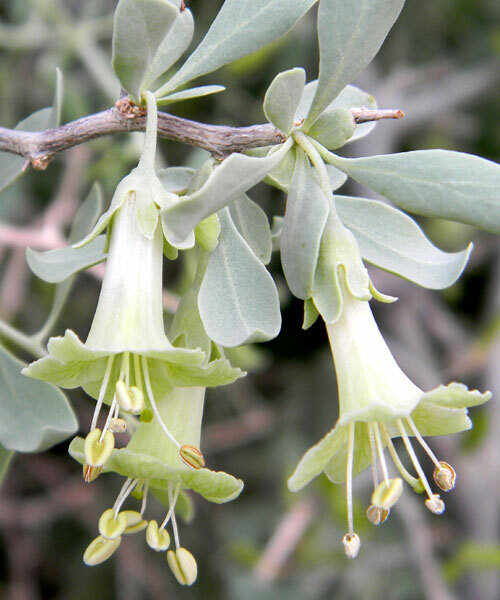 FLOWERS: The tubular flowers are cream-colored and often tinged green or lavender. The tube is long. LEAVES: The elyptical to oblong leaves are gray-green. SHRUB: A woody shrub with intricate branching. Most plants are 1 to 2 m. tall. RANGE: Rocky slopes, often in the shade of riparian trees or on partially shaded cliff faces. This plant ranges from California, Colorado and south to western Texas and Mexico. FRUIT: A succulent red berry with several to many seeds. Like the other wolfberries, they are edible, but there is a lot of variation in flavor between plants. ARMED: Thorns present, but often not so sharp.